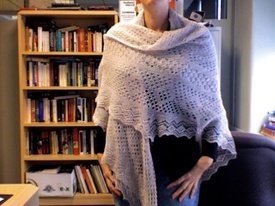 This is totally old news, I know... the shawl that was finished a year and a half ago, that was worn almost non stop for a goodly part of my stay in Russia last year. However, that wearing non-stop thing meant that it desperately needed to be washed. And that meant that it needed to be reblocked. And so, now that I've acquired more styrofoam for blocking, I did. It really, really needed the wash--I was shocked at how dirty it'd become. 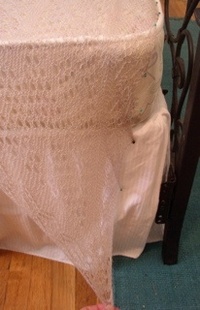 And it's amazing how different lace, or a shawl more generally, is at different stages. It was still lovely before the reblocking, but it had tensed up again; the points had become less pointy, the whole thing had become less ethereal and light, and its dimensions had shrunk. Now it's back to its floaty self. 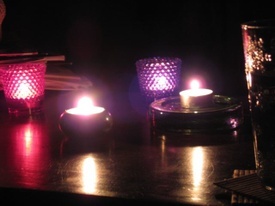 In other news, anyone else turn out the lights last night? I did, and the TV and computer, too. Turns out your eyes get used to low light fairly quickly. And thus it turns out that it's totally possible to do dishes, clean up the kitchen, and straighten up the bedroom by candlelight. Reading? Not so much. 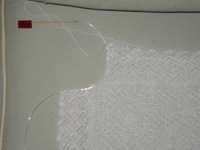 Knitting lace? Didn't even try it. 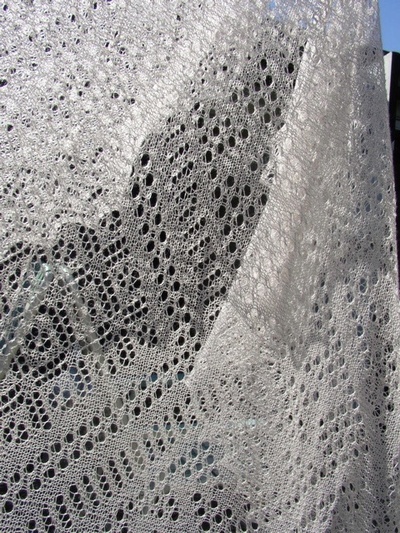 Despite that, I'm going to have yet another piece of lace to block later today; this week I've been working on finishing up the alpine lace scarf I last posted about... holy crap, in September of last year. Well, then, it's about time I finished the damn thing. I've barely worked on it since then, perhaps doing a pattern repeat once or twice. But I just finished it up, and now have nothing left but the bind off row, which I started last night, and then decided I was too tired to do properly, which means loosely enough. But I'll tackle it today, and perhaps block it as well. I've decided that I must just wear my Orenburg shawl, damn the fanciness, because otherwise it'll just sit around... not being worn. Which means, of course, that I have it at the office. Which means a photo of it, on. There'd be an exclamation point after that, but I've got a cold, and it's not making me feel very exclaimy. In fact, it's mostly making me sit here attempting, but not very much succeeding in that goal. We're talking sitting, staring, knowing what I want the new introductory passage for this part of the chapter to say, and being somehow totally unable to put that down on... er... the screen. 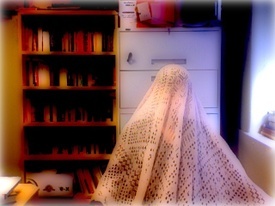 To show just how sort of out of it I am, I was also struck by the notion that the shawl would make a pretty darned fancy ghost costume for Halloween. And the "glow" effect of the photobooth program makes a lovely thing. So. 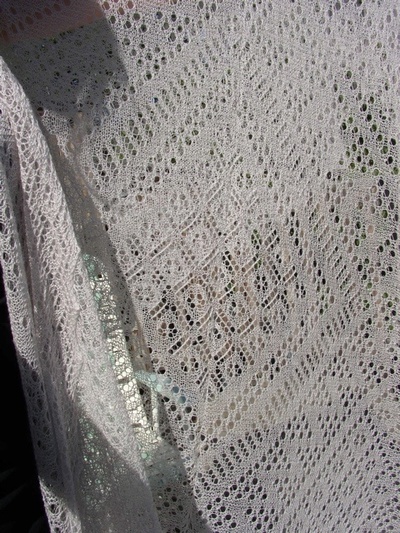 Glowy ghosty shawl picture time. See my bookshelves? They're already all filled. Ah well. Aaannndddd... off we go. Work ahoy. Once I blow my nose. Except that I should perhaps have moved the lawn chair before photographing on my lame deck. Because I've been pushing in a lot of pins. Yes, it's finally blocking time. Two things are currently pinned out, and will hopefully dry by the end of the day. So I can, you know, sleep on my bed. Actually, the Orenburg is currently sitting under a damp towel, because the process of blocking it took SO MUCH FREAKING TIME that it started to get too dry even as I was finishing up blocking it, and I worried that it wouldn't hold its shape quite right. Not that I want it to exactly hold this shape, because it's a little uneven, but, still. Why so long? 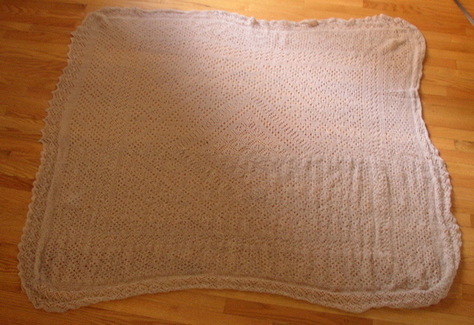 It's very big, and I tried a few ways of blocking it that didn't quite work out, for various reasons. Mostly because I only have two hands, and arms that aren't all that long, and it's very big. Now, first I thought I'd try the Russian method, which involves stringing all the points on a long thread and pulling and arranging and blocking using that. So, last night, I strung the whole thing on some fishing wire. Short story? It didn't work. I think I needed at least another set of hands, and possibly a few stiff drinks. I was also trying to do it out on my deck, on a sheet, because it was the only big flat surface unencumbered by all sorts of things, and the wood's not really very good, and I figured I could actually poke pins in it (which turned out to be disturbingly accurate, though not entirely). Today's gloriously sunny, so it seemed like the perfect chance. But it was also still damp from rain yesterday, so since the whole lines thing just didn't work, it seemed like I might as well just try something inside. So, next, the bed and pins. Off with the sheets and pillows and all that. 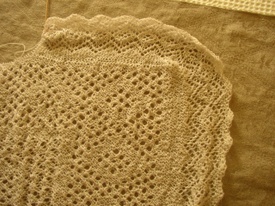 On with the shawl. And, as you can see, it's big, and my bed's only a double. The problem is more obvious when you look at this view. 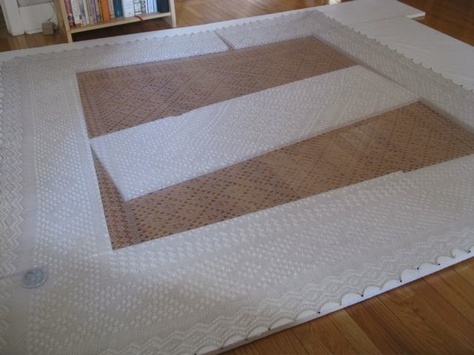 When I pinned the center of one side at the center of the bed, I ended up with not just a little overhang, but a lot of overhang. 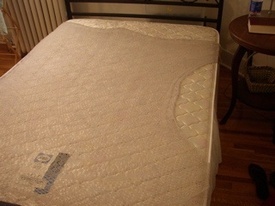 If I'd had to go over the edge of the mattress and stayed on that, that would have worked. 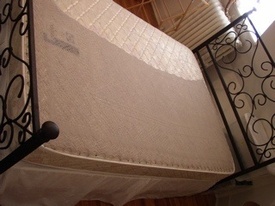 Perhaps even staying on the box spring. But this? No, this wasn't going to work. Particularly since the lack of extra hands was hurting here, too, because pulling tightly in one direction proved problematic for pulling in another direction, and the whole thing was getting frustrating. Argh, I thought, and unpinned and started to fold the thing, thinking I'd wait until some unspecified future day when I had more patience to deal with it. And then I realized that when folded in half, with a line threaded through the fold to keep it more or less straight, I could actually manage the pinning. And so, starting in the middle, working out to the corners, then up the sides, then pinning out the line, not the shawl itself, along the center, I hope I've managed to block it reasonably well. In the meantime, I'm also in the middle of blocking the roundabout leaf tank. Much to my surprise, I'm blocking it wide, not long. I assumed I'd want to add extra length, but it's actually just fine, length-wise. But a bit more, er, snug, than I'd ideally like. Actually, it's an interesting lesson in ease. As I realized earlier in the summer, negative ease can be definitely a good thing on some projects. Not so on this one. While the other summer tank I'm working on (in principle; I haven't touched it since June... but finishing it is next on the list so I can feel justified in starting something else) needs to be a bit fitted, this one really doesn't need to be. Bandages. It looks like mummy wrappings if it's too tight. So, here, too, keep your fingers crossed that it works out OK. I will say, I like the bamboo, and it did soften after washing. I'm still flummoxed at how much it tightened in the joining; I honestly did think about the ease question, and started the join I thought with plenty of ease. But, well, live and learn. And finally, a Toronto image. This is parked outside my office building every day. The particularly Toronto thing (or perhaps particularly Canadian thing)? 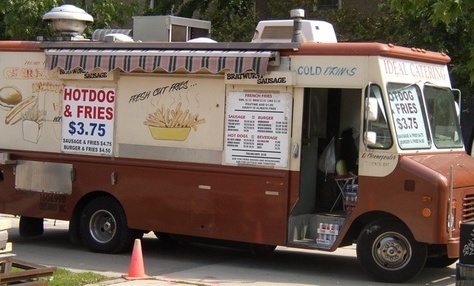 On the menu, it notes that with fries, "gravy is always free." In the midst of all the transition and packing and cleaning and moving and driving and sitting and all of that, I've also done some knitting. Still in Colorado, I finished the first cable sock, begun in Australia. I'm very very happy with it. It fits perfectly, is snug but not tight, and is a lovely color. Yesterday I cast on for the second sock, because I was going to be signing up for various Canadian governmental services, and thought I might end up waiting in a lot of lines, and a sock is good for that. As it turned out, I got one half of one row of knitting done while waiting. That's it! Amazing! 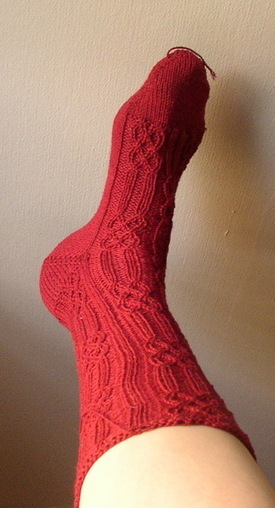 That said, I've already finished the toe cap, and knitted the first four rows of the cable rib. I've decided to take a clue from desiknitter by reversing the cabling on the second sock, so they end up being mirror images, not exact copies. It's a minor change, and possibly not even noticeable by anyone, but I think it'll be kind of a nice detail. And, anyway, it lets me do more front crosses than back crosses, which is all for the good. My lovely green milanese lace tank has not been touched since my return, even though it was getting awfully close to done even then. This is mostly because I can't remember what I was going to do next. I should really get into the habit of taking better notes, I think. 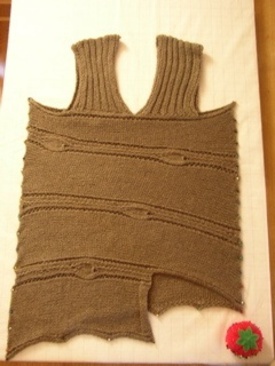 But also because I've kept working on the roundabout leaf tank, which is not worthy of picture taking, necessarily, but has been a nice relaxing knit, basically simple with a bit of interest. I ended up frogging a bunch that I'd done, because the spacing wasn't right (it's still not perfect, but I've decided to see how it turns out anyway). That allowed me to figure out a better, tighter way of picking up the edge stitches, so it turned out to be all for the good. I'm two rounds and a bit done at this point. Now, here's the thing. This looks done, but I'm not sure that it actually is. Some time last week, while in CO, sitting around my steadily more upheaved (can that be a verb?!) living room with my mom, I got to this point. The fourth corner, waiting to be turned. I'd finished the top row of border (yay! ), and had not much more to do. And then I realized I'd packed the instructions. All of the knitting books, sitting in a box, under other boxes, inaccessible. I could, of course, have started ransacking boxes. But I'm a firm believer in not making life more difficult for myself if at all possible, and after having gotten everything into boxes, I was not about to start pulling it all out until it got to Canada. What to do? Look to the library! I was able to find not the exact pattern, but Galina's other book, which talked of how to turn the fourth corner in a basic way. So I followed the basic idea, adapting it to the particular pattern of my border. And bound together the remaining edges, not quite perfectly, I think. 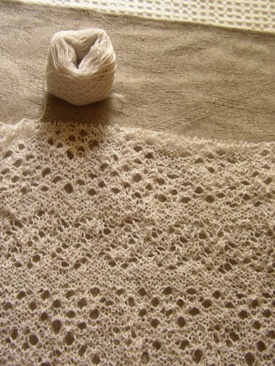 So, in other words, it might be done, and ready for blocking. But I'm not entirely sure about it, and won't proclaim it so until I double check against the official instructions (this is particularly true because the ending yarn has not ended where I think it ought to be, so I really want to check that out). But, basically, virtually as soon as my stuff gets here, it'll be done. And then blocked. I'm not quite sure how, yet, but it'll be blocked. The third corner, that is. The main body's done. I finished off the second skein with about two and a third rows to go. So close! I'm actually knitting the new skein from a swift. It takes a long time to wind a skein this long, and if I can finish before I leave it'll be better packing material not wound. Yesterday I finished off the last sixish rows of the main body, turned the third corner, and finished six points of the top border. That makes 28 points to go, plus the fourth corner and last bit of grafting. Holy crap, I'm almost done! 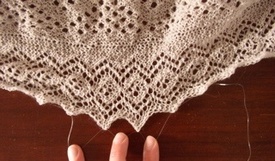 I've done very little work on the Orenburg shawl since getting back from Australia. Mostly, I've been too tired. I did a couple of rows the first full night I was back, and decided to stop for a bit until my jet lag was better. Seriously, it both put me to sleep and made me overly anxious because I felt like I kept almost dropping stitches, which would be awful at this stage (though at least there are those garter rows that wouldn't be bad to frog to). Then there was the yarn anxiety. I've only got a bit left to do, but I don't think this little ball will be enough for it. Now, this is obviously not new, as I've posted about if before. And, indeed the last time I got to thinking about it I emailed a bunch of places I found on line that sold the type of yarn, asking after the dye lot. None of them had it. I also (and I can't remember where I read that one could do this) emailed Skacel, the maker of the yarn, asking if they knew of a way to find it. I heard nothing back from them, so I assumed that I was out of luck. But I hesitated to order a skein of the color in a different dye lot, hoping something would turn up. And lo and behold, on my return to the US I came home to 12 or so messages from yarn stores who'd received the (quarterly? who knows) Skacel newsletter which featured my request as part of a regular "hunting high and low" column. All had the yarn in the right color and dye lot! Amazing! So I called the first yarn store to leave a message, and sure enough, they still had the yarn. And today, what was delivered to my happy happy house? 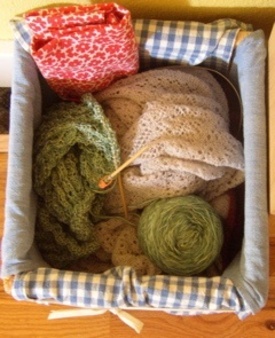 Now I can wind the yarn before packing away my knitting supplies, and finish this up in the relatively near future. Thanks so much to Lois Henderson of Allyn Knit Shop and Spinning Supply in Allyn, WA. You rock! I'm leaving for Australia on Saturday, and I'm bringing two knitting projects along: the roundabout leaf tank, on which I've done nothing since figuring out how I want to do the edging, and yarn for a pair of socks. They're both particularly portable, especially as the trip starts up, so they're kind of ideal. In the meantime I'm getting so close to being done with these two projects, and it's hard to choose what to work on! I've ended by default working more on the shawl, because it's finally so close to being done that I'm just motoring through, trying to finish. I've got 40 rows of the main body left, and have been managing 10-12 rows a night, when I've got time. So I should have virtually the whole body done by the time I leave on the trip, and be able to finish the whole thing before the move to Toronto. But there's a part of me that wanted to finish off the green tank, because I could then wear it on the trip. not that it'd be entirely appropriate for winter in Australia. Instead, I've hit the point where I'm going to split into the front and back, and because this now requires thought, I've stalled. I do want to finish it sooner than later, though, because, well, summer. Argh! And then to top it off, I'm really loving Julia Child's memoir, and want to spend time reading it, not knitting (something made all the more necessary because I've got to return it to the library before I leave). Another bit of wisdom from Julia, one that I've got to remember: "I don't believe in twisting yourself into knots of excuses and explanations over the food you make.... Usually one's cooking is better than one thinks it is. And if the food is truly vile, as my ersatz eggs Florentine surely were, then the cook must simply grit her teeth and bear it with a smile--and learn from her mistakes." I know it's a bit hard to see in this picture. But, yes. That's garter stitch. In other words, no holes. Just plain solid knitting. What does that mean? I'm done with the big central square of the shawl, and am about to embark on the inner border pattern, the circles about which I wrote so very long ago. 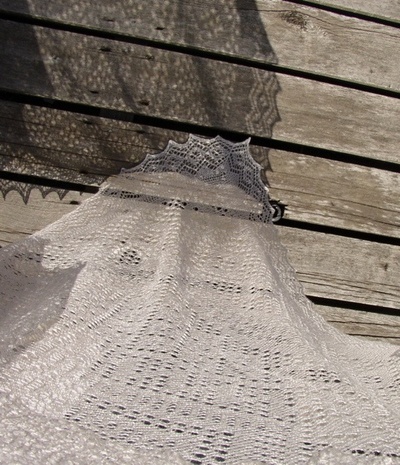 Then it'll be another bit of plain garter, then the outer border, then a bit more of garter, and then the pointed edge along the top. And then it'll be done. That still sounds like kind of a lot, but at this point the knitting's so much easier than in parts of the main body. Seriously. Fantastically easier. I have 86 rows of the main body to go. 86 of 542. Wow. I may get this done before I move. OK, I just had to edit a bit. First, the post title's been changed, because "rounding third," while a fairly accurate baseball metaphor right now, will be a better metaphor when I'm actually turning the third corner. And because I just did some math. 542 rows times 273 stitches per row. That's 147,966 stitches. Not even including the border.